In the world of film, a new film by director Pedro Almodovar is always cause for celebration. Already a living legend, Almodovar's films were even the subject of a touring retrospective called Viva Pedro in 2006, in honor of his then latest film, Volver. His collaboration with Penelope Cruz has been developing over the years, with Cruz appearing in 4 of his films since 2007 - Live Flesh, All About My Mother, Volver, and now his latest effort, Broken Embraces. Almodovar has always been one to work with the same core group of actors - Carmen Maura, Antonio Banderas, Blanca Portillo, Lola Dueñas, and Chus Lampreave just to name a few. There is always a comforting familiarty in seeing these faces in his films, even when the films take dark or disturbing turns. Their mere presence is an immediate signal that we have entered Almodovar's world, and are in the hands of a consummate storyteller. But his relationship with Cruz has become something akin to that of a bard and his muse. While I stand by my assertion that Almodovar's finest film is All About My Mother, the increasing presence of Cruz seems to have inspired Almodovar's creative juices, culminating in Volver, which garnered Cruz her first Oscar nomination, and seemed to sum up everything Almodovar has tried to do in his career so far. Lena looking in the mirror. Photo by Emilio Pereda & Paola Adizzoni. Ó Emilio Pereda & Paola Ardizzoni/El Deseo, Courtesy of Sony Pictures Classics. For Broken Embraces, however, the heat seems to have cooled. If Volver was the peak of the Almodovar/Cruz collaboration, then Broken Embraces is the beginning of the descent down the other side of the mountain. That is not to say that it is a bad film. Quite the contrary, it is a perfectly respectabl, solid effort. But coming from a master like Almodovar, one can't help but feel a little underwhelmed. Broken Embraces is essentially a modern film noir, but insead of black & white, it is painted with Almodovar's trademark bright palate of luminous warm colors. The film centers around Harry Caine (Almodovar veteran Lluís Homar), a blind screenwriter who, after a tragic traffic accident that claimed the life of his lover, Lena (Cruz), changes his name from Mateo Blanco, and leaves his life as a successful film director to try to start again, and leave the pain of his experience behind. But the past, as it has a tendency to do, catches up with him, when the son of Lena's villainous husband shows up on his doorstep with an idea for a script that sounds hauntingly familiar. This plunges Caine into a sea of memories, as he relates the story of his affair to the ailing son of his production manager one evening, and how his life was turned upside down by jealously and intrigue during the making of his final film. Diego and Judit. Photo by Emilio Pereda & Paola Adizzoni. Ó Emilio Pereda & Paola Ardizzoni/El Deseo, Courtesy of Sony Pictures Classics. For the most part, Broken Embraces is a very subdued effort by Almodovar, dwelling more on nuances and textures than his more colorful works. In that regard it is not unlike the director's own Live Flesh, which tones down some of his more lavish instincts in lieu of a much darker, quieter tone. It is also a film that is really about the relationship of the director to his film, and the importance of editing in a film's success. After he was blinded, Lena's jealous husband threw Mateo's unfinished film together haphazardly in an effort to destroy his professional reputation. It is a knowing dig at studio suits who wrest control of films from their directors to edit them their own way, destroying the director's creative vision and creating something wholly different. That is probably the film's strongest message, one that is obviously deeply personal for Almodovar. The rest of the film, however, ultimately fails to make a deep impression. It fades surprisingly quickly, a small diversion to the film's ultimate theme of editorial control. It never rises above the feeling that this is a relatively minor entry in the director's impressive canon, as if the creative juices inspired by his collaboration with Cruz has begun to run out. The film never sears itself into the memory the way so many Almodovar films do - I'm thinking of the broad absurdist comedy of Women on the Verge of a Nervous Breakdown, the unnerving sexual sadomasochism of Matador, the pornographic despair of Law of Desire, the haunting desire of Talk to Her, the eerie rendition of "Moon River" in Bad Education and its unforgettable association with pedophilia in the Catholic church. There is nothing in Broken Embraces that takes hold of the audience in such a way. And while its self referencing love of cinema is a feast for any cinephile, I can't help but feel that the film ultimately just runs out of gas. From anyone else, this would be a solid, respectable effort, which it ultimately is. But when held against such an illustrious career, Broken Embraces comes up short. 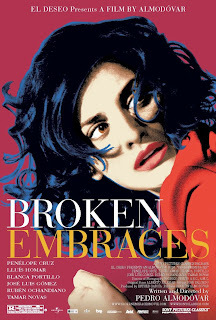 BROKEN EMBRACES; Directed by Pedro Almodovar; Stars Penelope Cruz, Lluís Homar, Blanca Portillo, José Luis Gómez, Rubén Ochandiano; Rated R for sexual content, language and some drug materia; In Spanish with English subtitles; Opens tomorrow, 11/20, in select theaters. It is very interesting for me to read the blog. Thank you for it. I like such topics and everything connected to this matter. I definitely want to read a bit more soon.